Kermit the frog is left handed! 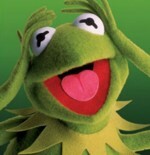 It's possible that Kermit was made out of a green coat and his eyes were made out of ping pong balls. There is a myth that Kermit was named after Kermit Scott who was friends with Jim Henson when they were kids.